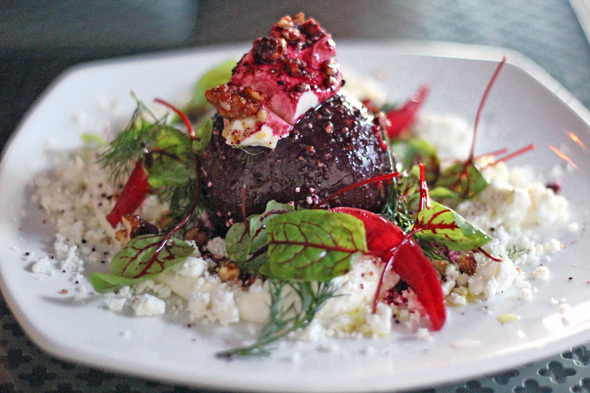 Origin Liberty is Chef Claudio Aprile's foray into a dining scene that's seen its ups and downs . Aprile has had had great success with both Colborne Lane and Origin on King East, with more locations to come. 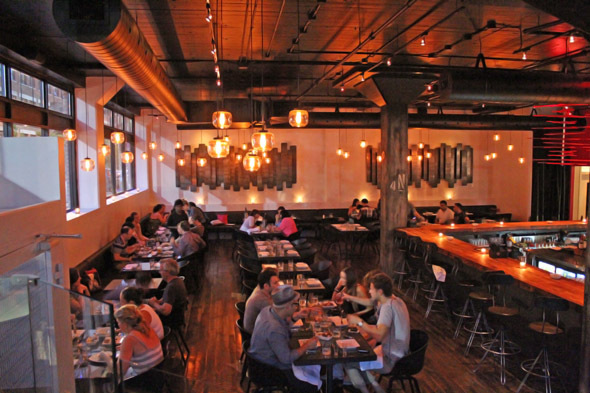 This newest Origin opened in the space that once housed Liberty Noodle . Liberty Village is notoriously hard on new restaurant ventures, but Aprile has expressed little concern, saying instead that "The menu is going to embrace the area." Sitting inside, the decor feels like Origin has been transplanted from King East. Wide windows look out on the area's old factory buildings, touches of wood echo the other location, while red resin machine gun casts suspended over the bar are a playful allusion to the restaurant's nickname--The Gun Factory-- which is a reference to the space's past life as a female-staffed WWII gun producer . There's also a patio that's expected to grow over the next year. 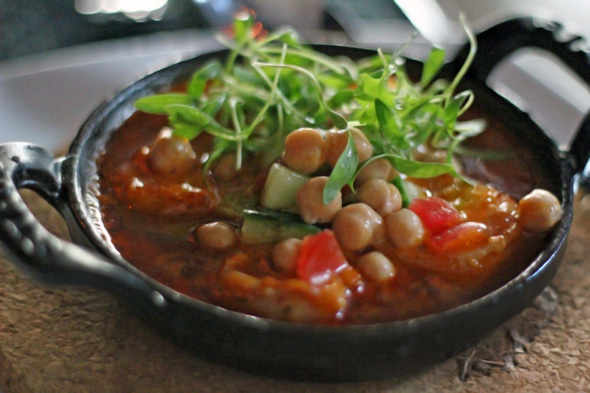 Like its predecessor, the menu is tapas-style, which is great for those who like to sample a little bit of everything. The Deviled Eggs ($6) were an amazing start with a decadently creamy yolk. Herbs and salt cut through the fat, while souffletine gave it crunch, and the dish was rounded out by bacon instead of the original panchetta. Next, we had the Beet and Goat Cheese salad ($12)--an extravagant amount of cheese and yogurt surrounding half a large pickled beet on a thin bed of fresh greens. The beet's juicy tartness was kept in check by the yogurt, but I would have liked more of the walnuts to counter the cheese's thick creaminess. 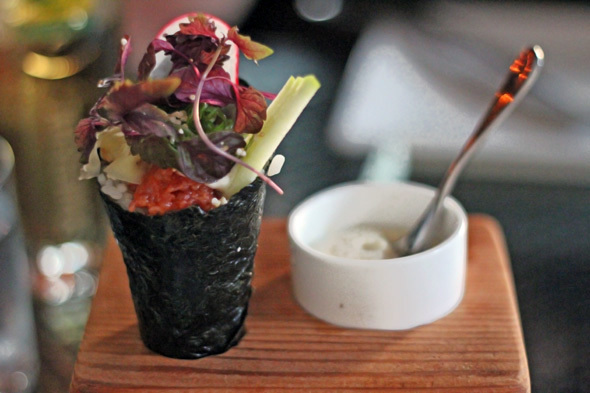 From the Raw Bar, we had the Spicy Tuna Handroll ($9). The spiced tuna was balanced by slivers of green apple and baby red shiso leaves, giving it a summery feel. The roll came with a tiny pot of miso mayonnaise which we polished off without shame. The hot items we chose are both new to Origin. 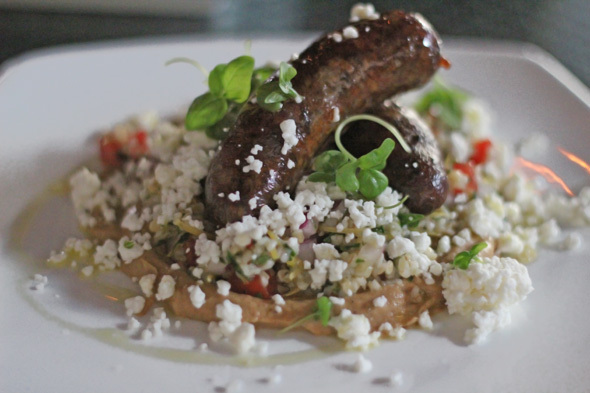 First came the Lamb Sausage with Caramelized Eggplant, Feta and Bulgar Wheat ($15), and it was the hit of the night. The sausage was meaty and gently spiced, and the eggplant had all the flavour of baba ghanoush with a perfectly smooth texture. We cleaned the plate off with the sausage. Next was Curried Shrimp with Naan ($17). The soft bread was flaky and charred on the grill, while the curry had great depth, and tasted of both pumpkin and peanuts. The shrimp felt a little superfluous, and we ate them quickly to better get at the sauce with the naan. The restaurant is barely a month old and still in its adolescent phase. The food is top-notch, though it's hard to say whether it is, in fact, reflective of Liberty Village. Service is polite but needs more time to feel polished. 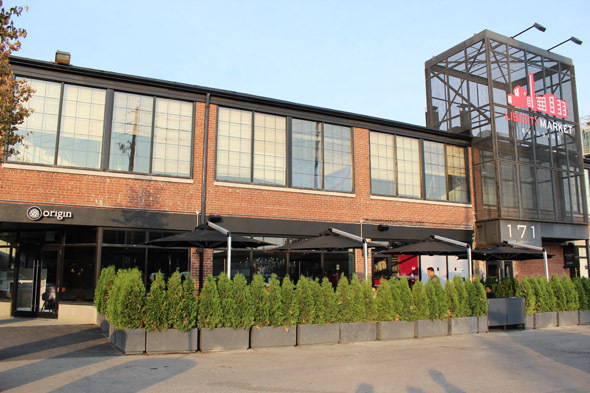 It absolutely has the potential to become one of the area's top destinations, and (assuming it lasts) can hopefully help Liberty Village's dining scene become even stronger.